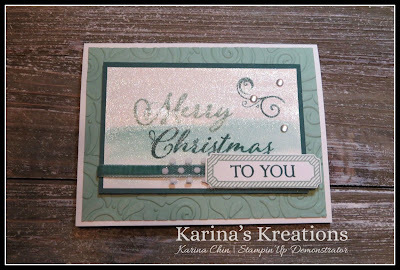 Karina's Kreations: Stampin'Up Merry Christmas To All! 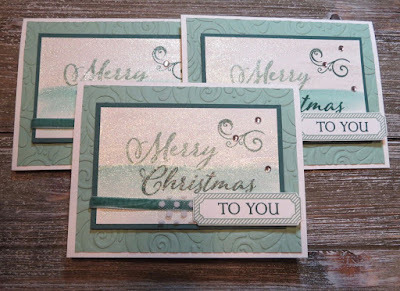 Stampin'Up Merry Christmas To All! I love the Stampin'Up Merry Christmas to All stamp set and Merry Christmas Thinlit Dies. When you buy both of these items together, you get so many different sentiment combinations. I made this card for my November set sampler swap. My challenge this month was coloring. I stamped the sentiment on Shimmery White card stock and colored the image with Champagne Mist Shimmer Paint and an aquapainter. When the ink is still wet, the color bleeds. Here's the supply list for my card. To place an order, just click on the picture below.